Echinacea Goldenseal Propolis Throat Spray by Gaia Herbs does the job! not an easy flavor to swallow, but worth it. Echinacea Goldenseal Propolis Throat Spray by Gaia Herbs is the best out there. Add Olive leaf and a great throat, mouth, voice support is easy. PureFormulas has great reliable service. 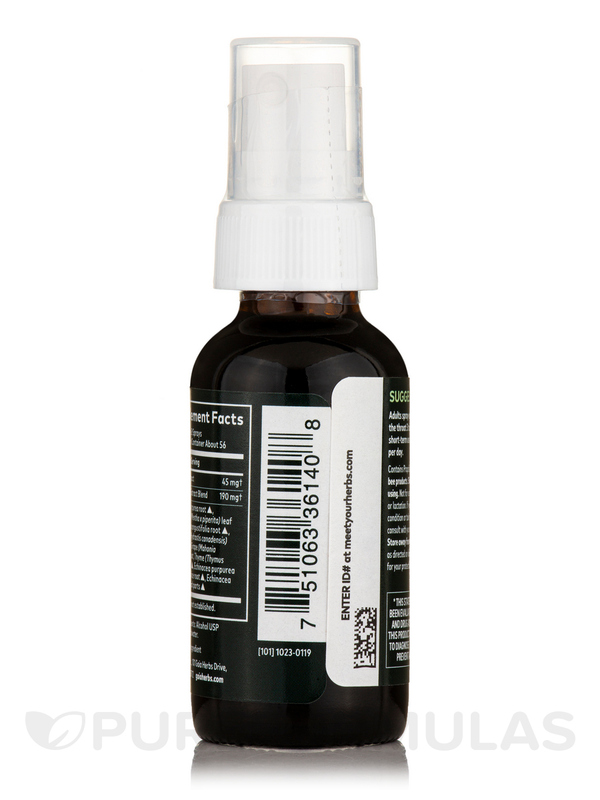 Wonderful Echinacea Goldenseal Propolis Throat Spray by Gaia Herbs spray for immune system and sore throats. Support a healthy immune system response with Echinacea Goldenseal Propolis Throat Spray 1 oz (30 ml) from Gaia Herbs®. This formulation may help maintain a healthy inflammatory response when there are seasonal changes that induce stress on the body. Echinacea may boost the immune system and alleviate the symptoms of colds and related infections. It could potentially fight the symptoms and prevent colds from developing. Research proves goldenseal’s efficiency in common cold and upper respiratory tract infections. Thyme and licorice in this supplement from Gaia Herbs® may work on sore throat‚ cough‚ bronchitis and other bacterial or viral infections. The chemicals in licorice reduce inflammation‚ thin mucous secretions and decrease cough. Peppermint appears to work on common cold‚ inflammation of the throat and mouth‚ cough‚ sinus and respiratory infections. Oregon grape may help support healthy immune function and keep the respiratory system working efficiently. Promoting normal secretion from the nose and eyes‚ Echinacea Goldenseal Propolis Throat Spray 1 oz (30 ml) from Gaia Herbs® appears to maintain respiratory system health. aquifolium)‚ Propolis+ Thyme leaf** (Thymus vulgaris)‚ and Licorice root+ (Glycyrrhiza spp. )‚ Water and 57-67% Pure Grain Alcohol USP. Average Herb Strength Ratio: 1:2.5. 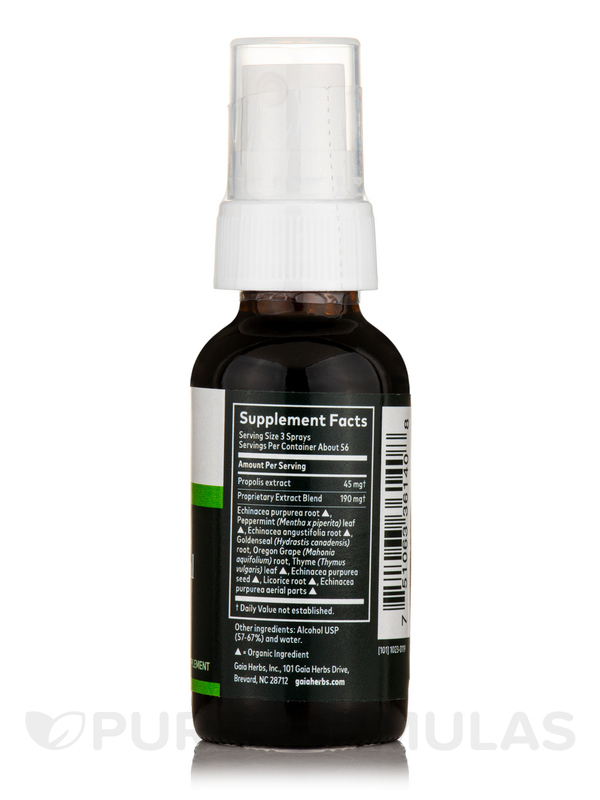 Spray extract into the back of the throat 3-5 times every 10-15 minutes as needed. For short term use up to 4 hours per day. If you have a medical condition or take pharmaceutical drugs‚ please consult with your doctor before use. 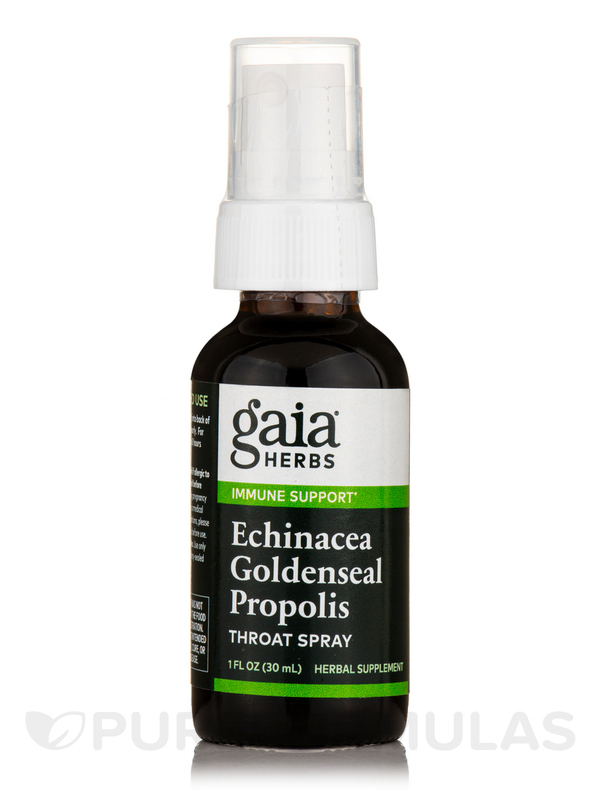 Love this Echinacea Goldenseal Propolis Throat Spray by Gaia Herbs! Keeps the throat bugs away! Does not taste to good. Works great, hard to swallow. There was a little problem with shipping speed, but PureFormulas was very responsive and went above and beyond to make sure I was taken care of. That was important, because this Echinacea Goldenseal Propolis Throat Spray by Gaia Herbs product has been helpful to me in the past and I had one of the worst colds I've ever had and needed it to help in my recovery. I've never ordered from PureFormulas before but you can bet I'll order again. And the product is the real deal, by the way. Helped me in my recovery, which is almost complete. A little sharp on the taste but worth it. Before I retired from primary education, I used Echinacea Goldenseal Propolis Throat Spray by Gaia Herbs daily to guard me from the germs that are everywhere in a school. I felt I got fewer colds, etc. when I used it. Now that I am there only occasionally, I use it on those days and when I am with my grandchildren, who are germ magnets. It's easy to use, inexpensive, reliable. The taste is very strong, like black licorice. With our crazy weather in the world these days keeping your immune system beefed up is a must. It was just summer time type of weather yesterday and today it snowed. Echinacea Goldenseal Propolis Throat Spray by Gaia Herbs has helped me become one of the few people who didn't get sick this year! Echinacea Goldenseal Propolis Throat Spray by Gaia Herbs is very good but the alcohol level in it is a bit excessive.I rate 5 stars anyway since the benefits are amazing. I bought Echinacea Goldenseal Propolis Throat Spray by Gaia Herbs to counter the first signs of sore throat or sniffles as it helps to protect the mucous membranes. Easy to administer and effective. Nothing, even the taste isn't a turn-off due to the effectiveness of Echinacea Goldenseal Propolis Throat Spray. I used Echinacea Goldenseal Propolis Throat Spray by Gaia Herbs in my mouth and throat when I am around sick people, also use for sinus issues when my throat does not feel right. Good product that helps keep me healthy.